I recently had a conversation with a colleague about a Buick that caught his eye at Costco, but he didn’t know what kind of Buick it was. I noted that probably the most eye catching Buick these days was the Regal GS, and when he saw a picture that I showed him, he pretty much confirmed it. Then I started telling him more about the performance aspects of the Regal GS and he became more interested. Then he asked about the price and that’s when his interest stopped. Even though Buicks of today are enough to grab the attention of this 30 year old, he still was in no position to afford a Regal GS. Clearly Buick now has the goods to catch the eyes of younger buyers, but they are perhaps still a bit too young to afford to buy a Regal GS. 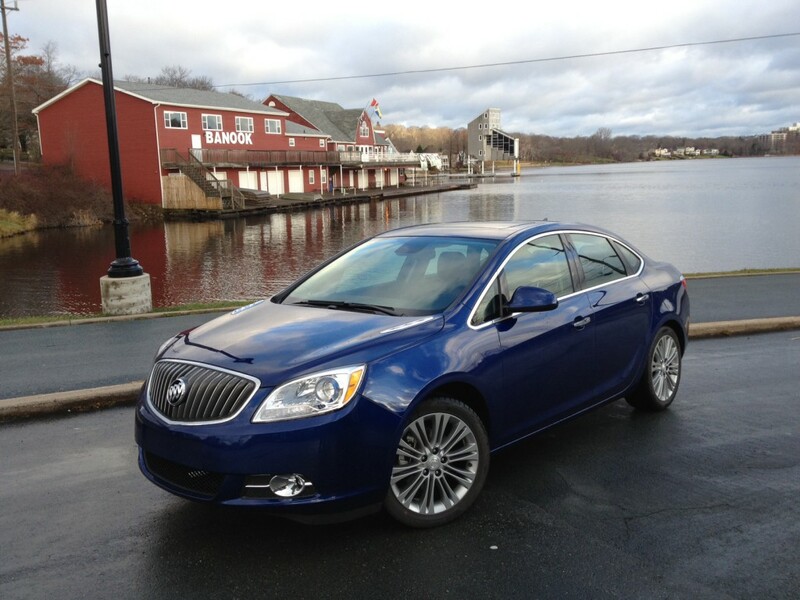 Then there’s the Verano which is much cheaper, but still no less worthy of a second glance. Well, that moment has arrived fellow performance enthusiasts. The turbo version has finally bowed, injecting some much needed performance into an otherwise good car and at a lower price point than the Regal GS. 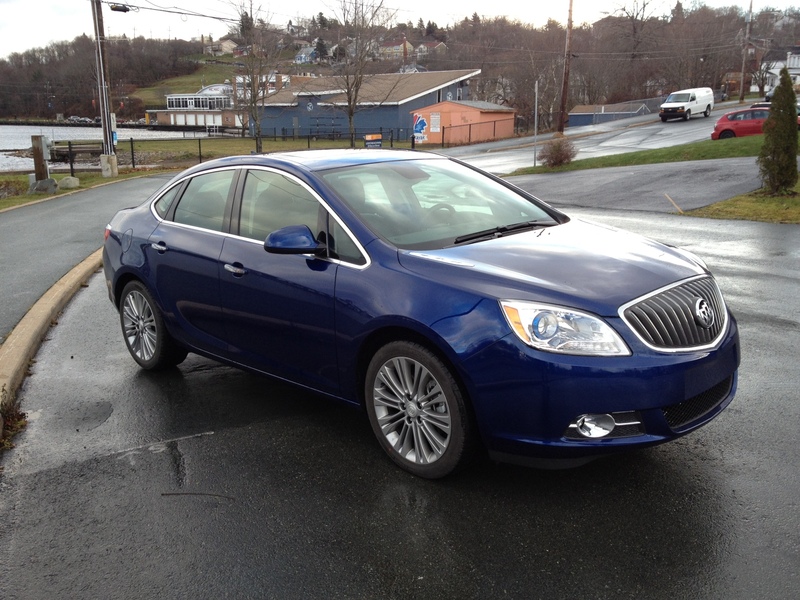 Do we finally have a Buick that the youngins will not only like but be able to afford? 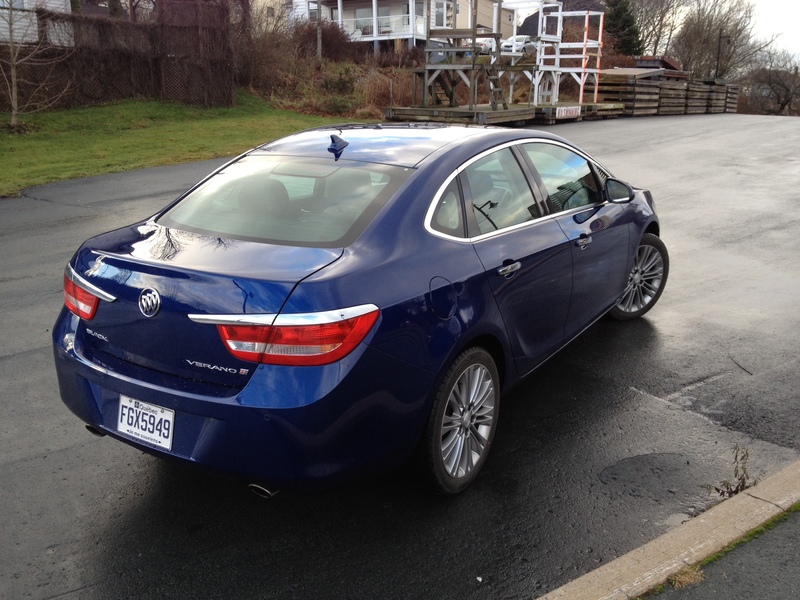 Looks wise, I described the regular Verano as a mini Regal which is definitely not a bad thing. In fact, there is very little to distinguish the regular Verano from the Verano turbo visually. The only way to do so is to look at the back end. Still don’t see it? 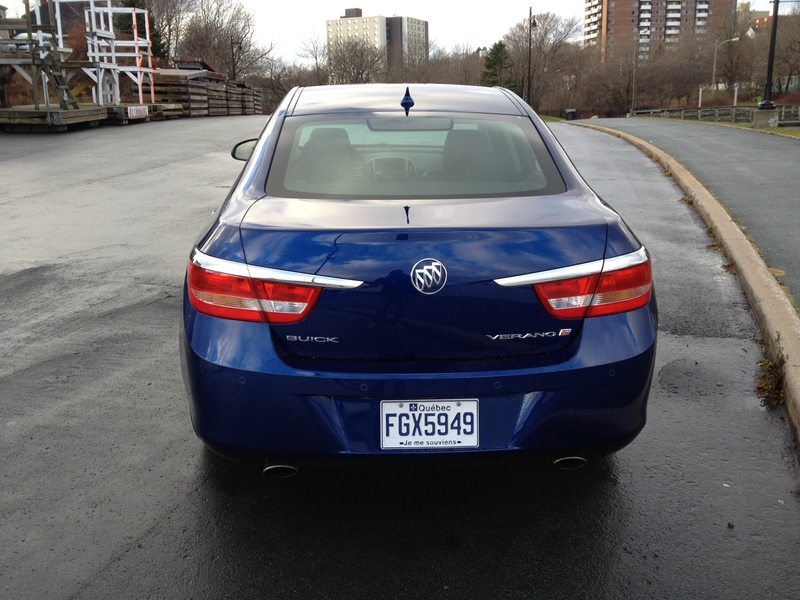 Well, there are only two things to look for: a ‘T’ badge next to the Verano’s name on the trunk lid and dual exhausts. That’s about it. While I appreciate subtle cosmetic enhancements for performance versions of regular road cars (the Volkswagen GTI is a good example) I think a little more could have been done to distinguish the Turbo model since it’s likely only car-nuts will notice such minor details. With that said, it makes the Verano turbo one hell of a sleeper. 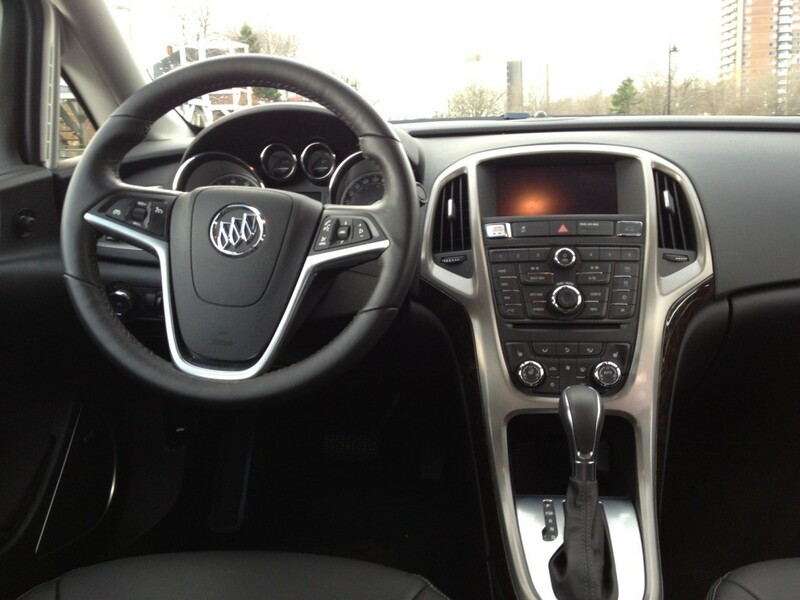 Inside, there isn’t too much to differentiate it from the regular Verano either. As such, it remains an attractive layout with high quality materials. The button layout can look a bit busy, however it’s still less overwhelming than in the Regal GS. 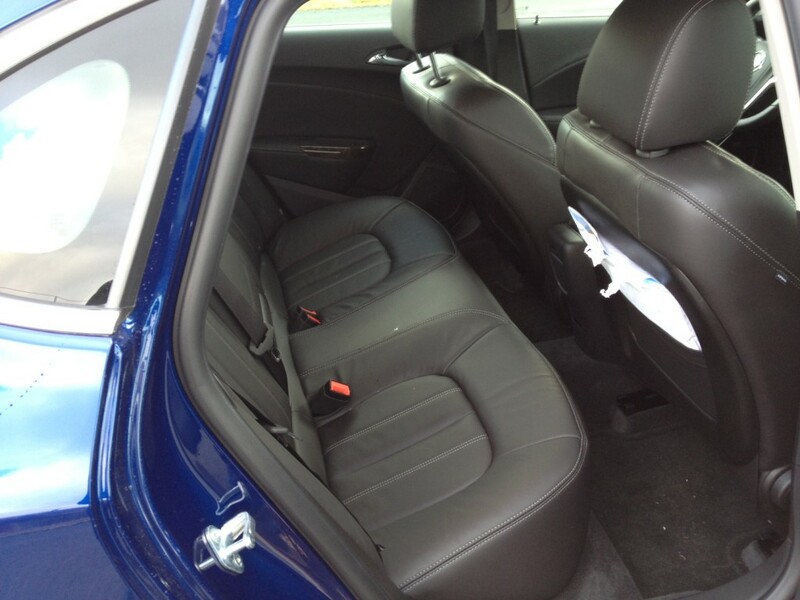 Interior room is good for passengers up front, however rear passengers will likely want to limit themselves to shorter trips as legroom is definitely not in abundance. Cargo room is though at 405 L worth of space with the seats up. One thing I did not is that the trunk lid hinges can crush any cargo when closing if you’re not careful. In the regular Verano, I was not adequately able to test the Bose speakers since one of the speakers was blown, but I was able to do so this time in the Turbo and I can confirm that the sound is quite good. 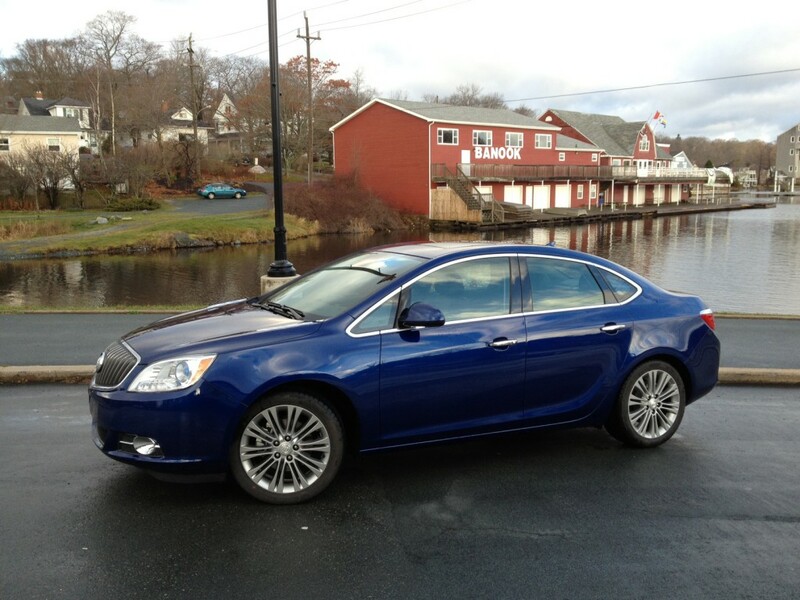 In fact, the music is pretty much the only sound you’ll hear in the Verano Turbo. Buick made a point to use lots of quieting technologies (their words, not mine) to ensure that the Verano is quietest in class. And it’s quite noticeable. The only thing impeding on this quietness is some road noise from the low-profile 18 inch wheels and tires. The regular Verano is able to churn out 180 horsepower and 171 pound feet of torque from a 4 cylinder unit. The Turbo ups those numbers to 250 horsepower and 260 pound foot torque. And oh my, what a difference that makes. Stomp your foot down and the Turbo will take off like a scolded cat, all while emitting a nice sounding exhaust note in the process. In fact, the Verano Turbo wants to take off so quickly that 9 times out of ten it will spin the front tires until the automatic gearbox shifts into second. That’s when the traction control steps in to ruin the fun, but even with the traction control on and the wheel spin the Verano Turbo can lay a decent straightaway run. Official numbers have its 0-100 km/h run at 6.2 seconds. That’s on par with similar offerings from Audi and BMW. It should also be noted that a six-speed manual is available at a no cost option as well for those of us who prefer to row our own gears. And even though I would suggest going with the six-speed, the automatic is fairly decent as well. The suspension has been tweaked from the regular Verano to account for some added curb weight, but it still uses an independent set up and the springs are 20% stiffer. This makes a noticeable difference when the road becomes twisty. The turbo feels solid in turns, however there is still some body roll with aggressive turn ins. Still, most corners were taken with confidence. 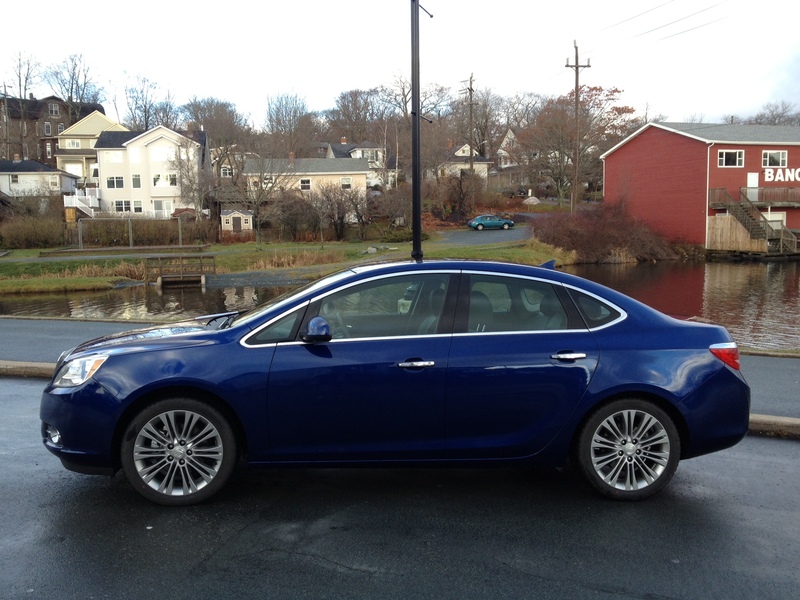 One downside is those same 18 inch wheels and tires that the regular Verano wears. If GM adds some performance tires then this would greatly improve its handling abilities. All said, this Verano Turbo is certainly tossable – perhaps even to the same extent as the bigger Regal GS simple because it’s smaller and feels more nimble. Fuel consumption is acceptable as it is officially rated at 11.2 L / 100 kms in the city and 7.8 L / 100 kms on the highway for the automatic. The six-speed manual gets rated at 11.7 L / 100 kms and 7.6 L / 100 kms. I averaged 10.5 L / 100 kms in mixed driving. The Verano Turbo takes regular gasoline. While those numbers are a bit high for what is technically a compact car, they are certainly decent for a performance vehicle. In fact, in general the Verano Turbo does well as a performance vehicle. One of my fellow auto reviewers who had the Turbo before me noted how impressed he was and this particular person rarely gets impressed by any press vehicle, let alone a Buick. I have to say it is one of the more well rounded cars in its segment. The fact that it appeals to both your Grandpa and younger people means that GM has finally done something most automakers wish they could. The Verano Turbo is a very good car.